Walker's use of relatively slight intelligence information in deciding to withdraw below P'yongyang reflected the general attitude of the Eighth Army. According to some accounts, Walker's forces had become afflicted with "bugout fever," a term usually used to describe a tendency to withdraw without fighting and even to disregard orders.5 Because it implied cowardice and dereliction of duty, the term was unwarranted. Yet the hard attacks and high casualties of the past week and the apparent Chinese strength had shaken the Eighth Army's confidence. This same doubt had some influence on Walker's decision to give up P'yongyang and would manifest itself again in other decisions to withdraw. But the principal reason for withdrawing had been, was, and would continue to be the constant threat of envelopment from the east. On 7 December in Tokyo, Generals MacArthur, Collins, and Stratemeyer, Admirals Joy and Struble, and Lt. Gen. Lemuel C. Shepherd, the commander of all Marine forces in the Pacific, considered the various views generated during the week past and agreed on plans that embodied in largest part the recommendations of General Wright. MacArthur set these plans in effect on the 8th in CINCUNC (Commander in Chief, United Nations Command) Order Number 5. He listed nine lines to be defended by the Eighth Army, the southernmost based on the Naktong River in the general trace of the old Pusan Perimeter. 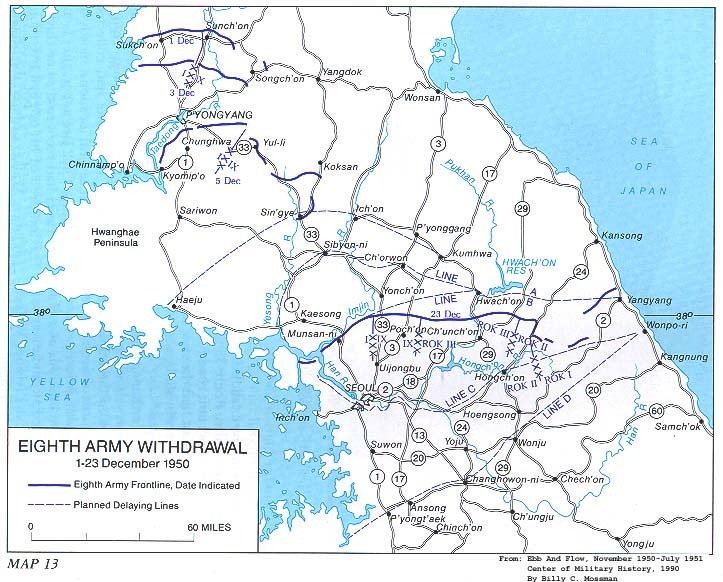 But he insisted that Walker not surrender Seoul until and unless an enemy maneuver unquestionably was about to block the Eighth Army's further withdrawal to the south. Related to this stipulation, four lines lay above Seoul, the last of which, resting on the Imjin River in the west and extending eastward to the coast, was MacArthur's first delineation of positions across the entire peninsula. Here the peninsula was somewhat narrower than in the PyongyangWonsan region and offered a road net that could accommodate supply movements.27 Earlier pessimistic reports to Washington notwithstanding, MacArthur apparently believed that the Eighth Army and the X Corps combined could man this line; indeed, he expected Walker to make an ardent effort to hold it. azines or other publicity media in the United States. "30 The Joint Chiefs of Staff forwarded the president's instructions to MacArthur on 6 December. On 11 December MacArthur made his first visit to Korea since he had watched the start of what was hoped would be the Eighth Army's final advance. He was now on the peninsula for a firsthand view of the Eighth Army and X Corps after their setbacks at the hands of the Chinese and for personal conferences with Walker and Almond on the steps the two line commanders had taken or planned to take in carrying out the maneuvers and command change he had ordered three days before. But while MacArthur earlier had proclaimed that only by advancing could he determine enemy strength, he had not designed or designated the UNC attack as a reconnaissance in force. Nor was it such. It was, rather, a general offensive whose objective was the northern border of Korea. On the other hand, except that the operations of his command really had nothing to do with "conditions of restraint and handicap," MacArthur was correct in his assessment of the quality of UNC operations. Indeed, in both advance and withdrawl his forces had conducted operations in far largest part with efficiency and with many demonstrations of gallantry. 1 Eighth Army Comd Rpt, Nar, Dec 50; Eighth Army G3 SS Rpt, Dec 50. 2 Ibid. ; Eighth Army PIR 142, 1 Dec 50; Sawyer, KMAG in Peace and War, p. 146; Appleman, South to the Naktong, pp. 618, 667. 3 Eighth Army Comd Rpt, Nar, Dec 50; Eighth Army G3 SS Rpt, Dec 50. 4 Ibid. ; Eighth Army PIR 142, 1 Dec 50; Eighth Army PIR 143, 2 Dec 50. 5 For example, British historian David Rees, in Korea: The Limited War (New York: St. Martin's Press, 1964), on page 171 entitled a section covering the Eighth Army's withdrawal "The Big Bug-Out" and on page 176 stated, "At the Front throughout December the moral collapse of the Eighth Army was complete, as bug-out fever raged everywhere." 6 General Almond officially remained the chief of staff. 7 Interv, Appleman with Hickey, 10 Oct 51; Eighth Army G3 SS Rpt, Dec 50; Rad, GX 30141 KGOO, CG Eighth Army to CG I Corps et al., 2 Dec 50. 8 Ibid. ; Eighth Army Comd Rpt, Nar, Dec 50. 9 Eighth Army Comd Rpt, Nar, Dec 50; Eighth Army G1 SS Rpt, Dec 50; Eighth Army G3 SS Rpt, Dec 50; "Turkish U.N. Brigade Advisory Group, 20 Nov-13 Dec 50"; Rad, GX 30139 KGOO, CG Eighth Army to CG 2d Div, 2 Dec 50; Rad, GX 30142 KGOO, CG Eighth Army to CG IX Corps et al., 2 Dec 50. 10 Eighth Army G3 SS Rpt, Dec 50; Rad, GX 30146 KGOO, CG Eighth Army to CG I Corps et al., 2 Dec 50. 11 Eighth Army PIRs 143, 2 Dec 50, and 144, 3 Dec 50; Rad, CG 30162 KGOO, CG Eighth Army to CG I Corps et al., 3 Dec 50. 12 Rad, GX 30162 KGOO, CG Eighth Army to CG I Corps et al., 3 Dec 50. 13 Eighth Army G4 SS Rpt, Dec 50; Eighth Army, "Logistical Problems and Their Solutions." 14 Eighth Army Comd Rpt, Nar, Dec 50; Eighth Army G3 SS Rpt, Dec 50; Eighth Army, "Logistical Problems and Their Solutions." 15 Eighth Army G3 SS Rpt, Dec 50; Eighth Army G4 SS Rpt, Dec 50; Eighth Army, "Logistical Problems and Their Solutions"; Field, United States Naval Operations, Korea, pp. 272-74. 16 Eighth Army G4 SS Rpt, Dec 50; Mono, Eighth Army, "Activities of the 3d Transportation Military Railway Service-The Withdrawal From Pyongyang," cp in CMH. 17 Eighth Army Comd Rpt, Nar, Dec 50; Eighth Army G3 SS Rpt, Dec 50. 18 Rad, GX 29613 KGOO, CG Eighth Army to CG I Corps and CG IX Corps, 5 Dec 50; Rad, GX 29660 KGOO, CG Eighth Army to CG IX Corps, 5 Dec 50; Eighth Army G3 in], 6 and 7 Dec 50. 19 Eighth Army Comd Rpt, Nar, Dec 50; Eighth Army G3 Jnl, 5 Dec 50; Eighth Army G2 SS Rpt, Dec 50; Eighth Army G2 Brief, 6 Dec 50; Eighth Army PIR 147, 6 Dec 50; Rad, GX 29685 KGOO, CG Eighth Army to CG I Corps et al., 6 Dec 50; Rad, GX 29706 KGOO, CG Eighth Army to C/S ROKA et al., 6 Dec 50. 20 Eighth Army G3 in], 5 and 6 Dec 50. 21 Rads, GX 29621 KGOO and GX 29661 KGOO, CG Eighth Army to CINCFE, 5 Dec 50; Briefing for CG, in Eighth Army G3 Jnl, 6 Dec 50; Rad, CTF 95 to CTG 95.7, 070206 Dec 50; Rad GX 29684 KGOO, CG Eighth Army to C/S ROKA, 6 Dec 50; Rad, GX 29685 KGOO, CG Eighth Army to CG I Corps et al., 6 Dec 50; Rad, GX 29706 KGOO, CG Eighth Army to C/S ROKA et al., 6 Dec 50; Rad, GX 29733 KGOO, CG Eighth Army to CG IX Corps et al., 7 Dec 50; Rad, GX 29794 KGOO, CG Eighth Army to CG I Corps et al., 8 Dec 50. 22 Rad, C 69953, CINCFE to JCS, 28 Nov 50; Rad, JCS 97592, JCS to CINCFE, 29 Nov 50; Rad, C 50095, CINCUNC to DA for JCS, 30 Nov 50; Rad, C 50105, CINCFE to DA, 30 Nov 50. 23 Rad, JCS 97772, JCS to CINCFE, I Dec 50; Rad, C 50332, CINCUNC to DA for JCS, 3 Dec 50. 24 Chief of Staff, FEC, Memo for Gen Collins, 4 Dec 50; Rad, JCS 97917, JCS to CINCFE, 4 Dec 50. 25 Schnabel, Policy and Direction, p. 283; Ltr, Lt Gen Edward M. Almond (Ret) to Col C. H. Schilling, 21 May 1965, copy in CMH. 26 Memo, FEC G3 for FEC C/S, 6 Dec 50. 27 Field, United States Naval Operations, Korea, p. 288; Rad, CX 50635, CINCFE to CG Eighth Army et al., 7 Dec 50; Rad, CX 50801 (CINCUNC Opn O No. 5), CINCUNC to CG Eighth Army et al., 8 Dec 50. The JCS formally approved MacArthur's plan on 9 Dec 50 per Rad, JCS 98400, DEPTAR (JCS) to CINCFE, 9 Dec 50. 28 Truman, Years of Trial and Hope, p. 383. 29 MacArthur Hearings, p. 3536. 31 Rad, CX 50635, CINCFE to CG Eighth Army et al., 7 Dec 50; Rad, CX 50801 (CINCUNC Opn O no. 5), CINCUNC to CG Eighth Army et al., 8 Dec 50; Rad, GX 29794 KGOO, CG Eighth Army to CG I Corps et al., 8 Dec 50. 32 Rad, GX 29857 KGOP, CG Eighth Army to CG 2d Log Comd and C/S ROKA, 9 Dec 50; Ltr, CG Eighth Army to CG 2d Log Comd, 11 Dec 50, sub: Construction of the Naktong River Defense Line and Completion of Construction of the Davidson and Raider Lines; Eighth Army Comd Rpt, Nar, Dec 50. 33 Rad, GX 35046 KGOO, CG Eighth Army to CG I Corps et al., 12 Dec 50. 34 Eighth Army Comd Rpt, Nar, Dec 50; Eighth Army G3 SS Rpt, Dec 50; Rads, GX 29874 KGOO and GX 35071 KGOO, CG Eighth Army to CG I Corps et al., 9 Dec and 13 Dec 50, respectively. 35 Eighth Army Comd Rpt, Nar, Dec 50; Eighth Army G3 SS Rpt, Dec 50. 36 Ibid. ; Rad, AG IN BSF-1305, CTF 90 to CG Eighth Army et al., 20 Dec 50. 37 Eighth Army Comd Rpt, Nar, Dec 50; Rad, GX 35176 KGOO, CG Eighth Army to CG IX Corps and CG 1st Cav Div, 15 Dec 50. 38 Eighth Army Comd Rpt, Nar, Dec 50; Rad, GX 35255 KGOO, CG Eighth Army to CG I Corps et al., 18 Dec 50; Rad, GX 35300 KGOO, CG Eighth Army to CG 2d Div, 20 Dec 50; Eighth Army G3 Jnl, 20 Dec 50. 39 Rad, CX 51694, CINCFE to CG Eighth Army, 20 Dec 50; Rad, GX 35321 KCG, CG Eighth Army to CINCFE, 21 Dec 50. 40 Eighth Army G3 SS Rpt, Dec 50; Eighth Army PIRs 149-156, 815 Dec 50; Rad, GX 35266 KGI, CG Eighth Army to CINCFE, 18 Dec 50; Eighth Army PIRs 163, 22 Dec 50, and 164, 23 Dec 50. 41 Eighth Army G2 SS Rpt, Dec 50; Eighth Army PIRs 148-164, 823 Dec 50. 42 Bomber Command meanwhile halted its attacks on the Yalu bridges and devoted its main effort to the interdiction of rail lines. 43 Futrell, The United States Air Force in Korea, pp. 243-45. The FEAF estimate of enemy troops killed in December was 39,694. 44 Eighth Army G2 SS Rpt, Dec 50; Eighth Army PIRs 148-164, 823 Dec 50. 46 Rad, GX 35226 KGOP, CG Eighth Army to CG X Corps, 17 Dec 50; Rad, CX 35321 KCG, CG Eighth Army to CINCFE, 21 Dec 50; Eighth Army PIRs 160, 19 Dec 50, and 163, 22 Dec 50. 47 Rad, CX 50635, CINCFE to CG Eighth Army et al., 7 Dec 50; Rad, CX 50801 (CINCUNC Opn O No. 5), CINCUNC to CG Eighth Army et al., 8 Dec 50; Cagle and Manson, The Sea War in Korea, pp. 183-84; Field, United States Naval Operations, Korea, pp. 286-88. 48 X Corps Comd Rpt, Sum, Dec 50; X Corps POR 74, 9 Dec 50; X Corps G3 Jul, Entry J-31, 9 Dec 50; X Corps G3 Jul, Entry J-28, 11 Dec 50; Field, United States Naval Operations, Korea, pp. 286, 288-89. 49 X Corps POR 75, 11 Dec 50. 50 X Corps PIRs 74-76, 9-11 Dec50; X Corps Comd Rpt, Sum, Dec 50. 51 X Corps OI 27, 9 Dec 50. 52 X Corps Comd Rpt, Sum, Dec 50. 53 Ibid. ; X Corps Opn O 10, 11 Dec 50; X Corps POR 76, 11 Dec 50. 54 X Corps Comd Rpt, Sum, Dec 50; Field, United States Naval Operations, Korea, pp. 289-90. 55 X Corps Comd Rpt, Sum, Dec 50; Field, United States Naval Operations, Korea, p. 289; Cagle and Manson, The Sea War in Korea, pp. 512-14; Futrell, The United States Air Force in Korea, pp. 241-42. 56 Cagle and Manson, The Sea War in Korea, pp. 181-82, 186-87; Futrell, The United States Air Force in Korea, pp. 24819. 57 X Corps Comd Rpt, Sum, Dec 50; X Corps Opn O 10, 11 Dec 50. 58 Ibid. 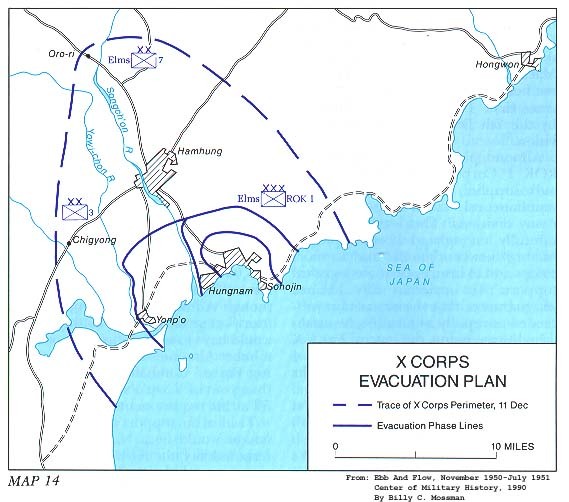 ; X Corps Comd Rpt, 11 Dec 50; Memo, Gen Almond, 11 Dec 50, sub: Movement of X Corps to the Pusan Area; Ltr, Gen Almond to CINCUNC, 11 Dec 50, sub: Redeployment of X Corps in Pusan-Pohangdong Area. 59 X Corps Comd Rpt, Sum, Dec 50; X Corps 0130, 14 Dec 50; Montross and Canzona, The Chosin Reservoir Campaign, pp. 338-41, 345; X Corps POR 83, 18 Dec 50. 60 X Corps Comd Rpt, Sum, Dec 50. 61 X Corps PORs 79, 14 Dec 50, and 80, 15 Dec 50; Dolcater, 3d Infantry Division in Korea, pp. 97-100. 62 X Corps PIRs 77-80,12-15 Dec 50; X Corps Comd Rpt, Sum, Dec 50. 63 X Corps Comd Rpt, Sum, Dec 50; X Corps PIRs 77, 12 Dec 50, and 78, 13 Dec 50. 64 X Corps PORs 79-81, 14-16 Dec 50; X Corps OI 31, 16 Dec 50. 65 X Corps Comd Rpt, Sum, Dec 50; Rad, CX 51019, CINCFE to CG Eighth Army et al., 11 Dec 50; Rad, CX 51102, CINCFE to DEPTAR, 12 Dec 50; X Corps PORs 8083, 15-18 Dec 50; Field, United States Naval Operations, Korea, p. 295; Rad, AG IN BSF-1305, CTF 90 to CG Eighth Army et al., 20 Dec 50. 66 X Corps POR 79, 14 Dec 50; X Corps Comd Rpt, 18 Dec 50; X Corps 01 36, 18 Dec 50; Futrell, The United States Air Force in Korea, pp. 241, 248-49; X Corps Comd Rpt, Sum, Dec 50; Cagle and Manson, The Sea War in Korea, p. 191. 67 X Corps Comd Rpt, Sum, Dec 50; X Corps PORs 83-85, 18-20 Dec 50; Dolcater, 3d Infantry Division in Korea, p. 102. 68 X Corps PIRs 81-85, 16-20 Dec 50. 70 X Corps Comd Rpt, Sum, Dec 50; X Corps PIRs 85, 20 Dec 50, and 86, 21 Dec 50; X Corps PORs 85, 20 Dec 50, and 86, 21 Dec 50. 71 X Corps Comd Rpt, Sum, Dec 50; X Corps PORs 87, 22 Dec 50, and 88, 23 Dec 50; X Corps PIRs 87, 22 Dec 50, and 88, 23 Dec 50; Dolcater, 3d Infantry Division in Korea, p. 102. 72 X Corps Comd Rpt, Sum, Dec 50; X Corps PIR 89, 24 Dec 50; X Corps POR 89, 24 Dec 50; Dolcater, 3d Infantry Division in Korea, p. 102. 73 Col Edward H. Forney, Special After Action Report, Deputy Chief of Staff, X Corps, 19 Aug-Dec 50, p. 14. 74 X Corps Comd Rpt, Sum, Dec 50; Field, United States Naval Operations, Korea, p. 304. 75 X Corps, Special Report on Hungnam Evacuation, 9-24 Dec 50. 76 Quoted in MacArthur Hearings, pp. 3536-539.